I know I am in the minority, but in a culture crazed for Christmas and Easter, my two favorite church holy-days are Pentecost and Maundy Thursday. I’ll get to Pentecost in about six weeks, but for now I want to think about what makes Maundy Thursday so significant for me. Farewells are often tricky, especially with those closest to us. I wonder if modern men and women can truly relate to the farewell between Jesus and his closest friends? Certainly we have close relationships — friends, families, coworkers, neighbors — but they are very different from the premodern, primitive culture of Jesus’ day. Depending on the gospel source, Jesus and the boys were together morning, noon and night for somewhere between six months and three years. They ate together, slept together, washed together, worked together, learned together, fought together. Jesus trained his followers each and every day of their relationship, and the day came to hand the reins over to the disciples. There is absolutely no evidence that any of them were ready to assume leadership; in fact, it wasn’t clear that any of them yet understood who Jesus really was. In the last week, it was clear that going to Jerusalem was less than an ideal opportunity for keeping a low profile. I love the visit to the temple in Mark — it says they got to the temple late in the day and that there wasn’t a sizable crowd — implying that the cleansing of the temple was part of a strategic plan to get attention — so they came back at the height of trade and Jesus upset the money-changers tables (a crime commensurate with going into a bank today and throwing all the money on the floor — frowned on then, frowned on now, only difference is that all our money doesn’t belong to a guy named Caesar…) Crimes were committed against the faith and against the state in short order, and there was little chance that Jesus & company would escape either notice or punishment. Once again, depending on the gospel source, likelihood to certainty prevailed as to impending arrest, so the synoptic supper and the Johannine foot-washing farewells are shadowed with eschatological significance. This was a truly liminal event — once the threshold was crossed, there was no going back. Jesus sat at supper with his closest friends and those in whom he entrusted the very kingdom of God. This is pure speculation, but I always picture Jesus watching, listening, taking pictures with his mind to freeze the moments in time. I can feel the tension in chest, throat, and stomach facing the loss of such companions. Jesus would never forget these friends and he realized that their own fidelity to him and his vision depended on them not forgetting him. And so with a sublime and simple act he made it forever impossible that anyone at table with him could fail to remember him. Jesus took bread from the table — the staple food of all meals. Bread was cheap and filling. There may be multiple times that people would go without meat or vegetables, but rarely would they go without their daily bread. Jesus got the attention of his friends and told them that bread was a symbol for his body — as he would be broken physically in short order, so bread was broken — but in the breaking was the path toward nourishment. To eat the broken body was a remembrance and a unifying act — and it wasn’t to be done once a month or on special occasions, but each time it is broken, each time it is eaten, it calls to mind Jesus the Christ. I was lucky enough to serve a church where some women got up early on communion mornings and baked bread in the church. The smell of fresh-baked bread filled the church, and often the bread was still warm when we shared it. The bread was GOOD, and every time I smell fresh bread, it brings my attention to Jesus. When I eat a sandwich or a roll that reminds me how good bread can be, it puts me in mind of communion. 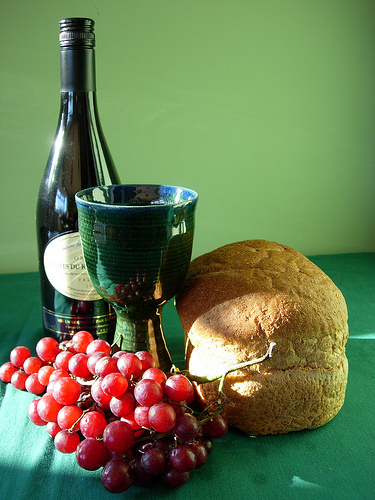 How wonderful if all table fellowship could be viewed as communion. At the end of the meal Jesus took a cup of wine, blessed it or gave thanks over it (or both) and transformed the staple beverage of the day into a means of grace and union. In many parts of the Middle East in 1st century, water was not always clean enough or safe enough to drink. Milk didn’t keep. Juices had to be fresh-squeezed or fermented or distilled. Much of what we call “wine” in the Bible is much more accurately “brandy.” Distilling killed bacteria and made spirits of the non-spiritual kind hugely popular. For fishermen, tradesmen and tax collectors wine drinking was likely as much sport as thirst-quenching. Wine was consumed morning, noon, afternoon, suppertime, evening and in between where appropriate. For Jesus to say “as often as you drink it, remember me” is incredible. For anyone who ate and drank (i.e., everyone!) they would have their memories jogged a dozen times a day — I remember Jesus. Mounday Thursday is my favorite service of the church year as well. Ah yes, one of the days that the Associate Pastor gets to preach! This concept should be shouted from the rafters of every church and taught in every Sunday school classroom (especially adult). I believe that most people do not really “get” the significance of this act, and other denominations, by excluding people from sharing it, only make things worse. What a wonderful way to keep Jesus with us at all times. Participating in our Maundy Thursday worship last night, it struck me that this worship really gets to the intimacy between us and God and us and others, which is at the heart of the Gospel. We are called to love one another — even as we are aware of their flaws and faults and they know us in the same way. That intimate love, the love of Christ, is extremely powerful. We had Tibetan singing bowls, naked feet for the foot washing, Holy Communion, images, music from everywhere, English handbells playing an African-American spiritual at our worship last night. It was very moving. i think it’s Borg and Crossan in the “Last Week” book that talk about celebrating a relationship with a divine being with a gift and/or a meal. That seems to fit well with your connection between eating and communion and the first last supper. That connection, for me, is another of a series of connections between ordinary living and faith. i think, for example, of “praying constantly” and an awareness of God’s presence. ISTM that sometimes we try to ignore the “ordinariness” or earthiness of our faith–to our peril–by “building a fence” of liturgy and elaborate building or whatever. The disconnect affects our perceptions of the earth and those who dwell there.